1. Bring 3 cups of water to a boil in a large pot. Season with a generous pinch of salt. Gradually stir in the polenta, whisking quickly to avoid lumps. Turn down the heat, continuing to stir. When the water is completely absorbed, add more water, a half a cup at a time -- at least 4 cups, but you may need more to get the consistency you want. 2. Cook the polenta for about 30 minutes, while you prepare and cook the rest of the recipe. Whisk briskly occasionally, and add water as needed to keep the mixture loose. 3. In a large skillet, melt the butter and olive oil together and add the leeks. Season with salt and pepper. Cook over medium-low heat, stirring often, until softened and starting to brown, 10-15 minutes. 4. Add the garlic to the keeps and cook a minute or two. Add the chard and Aleppo chile, and cook, stirring, just until the chard is wilted. Taste and season with more salt as needed. 5. Turn the heat off the polenta, add the grated cheese to the polenta, and whisk to melt. Taste and add more salt and pepper as desired. 6. To serve, add a generous scoop of polenta to a bowl. 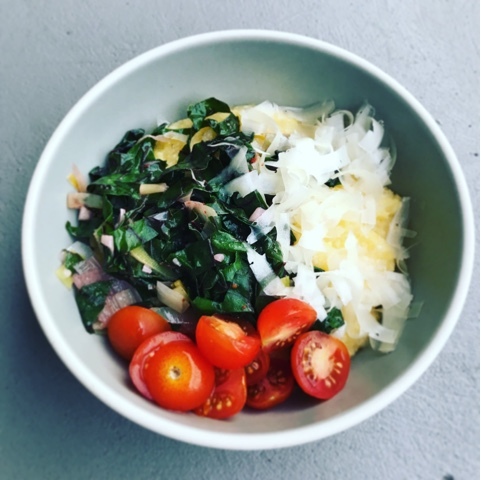 Top with greens, cherry tomatoes, and more grated Asiago cheese. You can also add an egg for protein. I have a hard time with slow cooker recipes, because I never want to be dealing with meal prep in the morning, before work. But, this one is actually easy enough that I was successful! 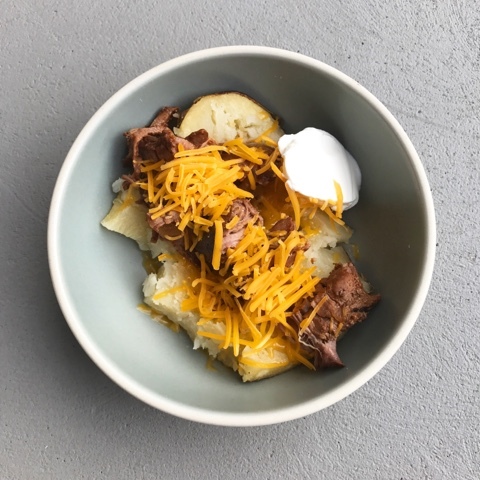 I prepared the spice rub, sliced the onion, and washed the potatoes the night before, so in the morning I just had to rub the spices onto the beef, wrap the potatoes in foil, and stick everything in the slow cooker. The results were really yummy, combing flavorful beef with hearty potatoes. I couldn't find the mini russet potatoes called for in the original recipe (4 ounces is tiny!) so had to use a more normal size -- they cooked most of the way through, but weren't 100% tender after the cooking time, so I had to add a couple of minutes in the microwave before serving. But, the beef was perfectly cooked, so I wouldn't necessarily add more time to the slow cooking, and I didn't find this step too annoying. Overall, definitely a winner! To serve: shredded cheddar cheese, sour cream, favorite barbecue sauce, scallions, etc. 1. Combine the brown sugar, tomato paste, Worcestershire sauce, chili powder, salt, and pepper in a small bowl. Rub all over the beef. 2. Spray the slow cooker insert with oil, and add the sliced red onion. Top with the beef. 3. Rub the potatoes with olive oil, and season with salt and pepper. Wrap in parchment or foil, and place on top of the beef. 5. To serve, split the potatoes. Shred the beef using two forks. Top each potato with the beef-onion mixture and any other toppings you like.